Background: This study was planned to determine the relationship between bispectoral index (BIS) during dental treatment and recovery conditions in children undergoing two regimes of anesthesia of propofol and isoflurane. Materials and Methods: In this single-blind clinical trial study, 57 4-7-year-old healthy children who had been referred for dental treatment under general anesthesia between 60 and 90 min were selected by convenience sampling and assigned to two groups, after obtaining their parents' written consent. The anesthesia was induced by inhalation. For the first group, the anesthesia was preserved by a mixture of oxygen (50%), nitrous oxide (50%), and isoflurane (1%). For the second group, the anesthesia was preserved by a mixture of oxygen (50%), nitrous oxide (50%), and propofol was administered intravenously at a dose of 100 Ng/kg/min. 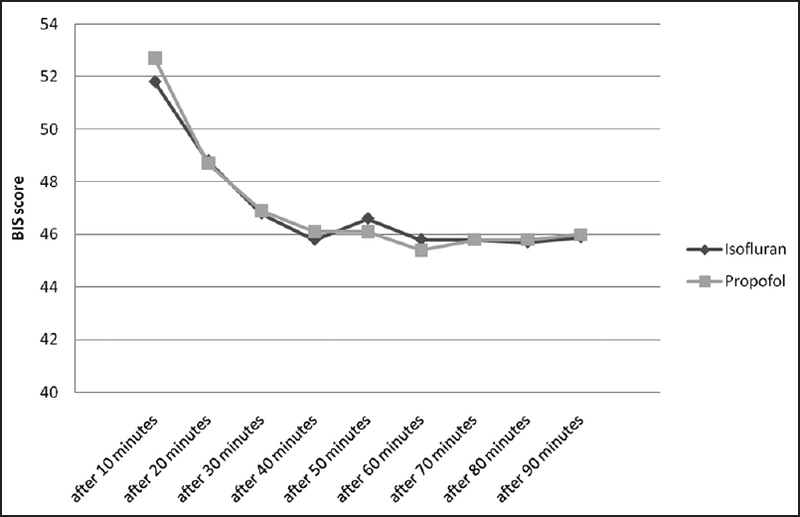 The patients' vital signs, BIS, and agitation scores were recorded every 10 min. The data were analyzed by repeated measure ANOVA and t-tests at a significance level of α = 0.05 using SPSS version 20. Results: The results of independent t-test for anesthesia time showed no statistically significant difference between isoflurane and propofol (P = 0.87). Controlling age, the BIS difference between the two anesthetic agents was not significant (P > 0.05); however, it was negatively correlated with the duration of anesthesia and the discharge time (P = 0.001, r = -0.308) and (P < 0.001, r = -0.55). Conclusion: The same depth of anesthesia is produced by propofol and isoflurane, but lower recovery complications from anesthesia are observed with isoflurane. Bispectoral index (BIS) is a noninvasive marker of the depth of anesthesia based on electroencephalography assessment. Based on the depth of anesthesia, BIS is scaled from 0 to 100. In conscious patients, the score is between 90 and 100 while it is zero for the inactivity of the cortical part of the brain. In order to maintain an individual in general anesthesia, BIS should be between 44 and 60. BIS monitoring is a simple way to prevent unwanted increases in the concentration of the anesthetic agent, which leads to fast effect and short recovery. Considering the increasing need for general anesthesia in pediatric dentistry and complications of various anesthetic agents, this study was conducted to determine the relation between the values ofBIS during dental treatment and recovery conditions in children receiving either of two regimes of elective anesthesia with propofol and isoflurane. The null hypothesis was: There is no significant difference between BIS scores of individuals who receive propofol and those who receive isoflurane. This study was approved under IRCT2013032212848N1 by System for Clinical Trials. This study investigated 57 children with a mean age of 5.29, who required general anesthesia for dental procedures. The mean age of the children for whom propofol and isoflurane were used to preserve their deep anesthesia was 5.32 ± 1.01 and 5.26 ± 0.98, respectively. The independent t-test showed no statistically significant difference between the two groups (P = 0.82). The normality of data distribution in both groups was evaluated using Kolmogorov-Smirnov test, the results of which showed the normal distribution of data in both groups. The mean time of anesthesia was 78.44 ± 26.9 and 79.64 ± 30.5 min in isoflurane and propofol groups, respectively. The results of the independent t-test showed that the difference between the isoflurane and propofol groups was not statistically significant (P = 0.87). The mean discharge time for the propofol and isoflurane groups were 108.9 ± 23.1 and 128.4 ± 31.2, respectively, for which the independent t-test showed a statistically significant difference (P = 0.01). 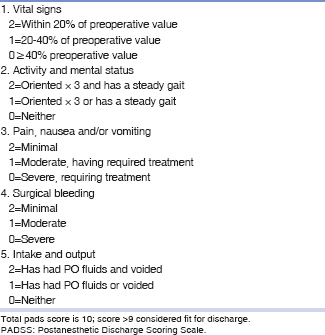 [Table 1] and [Figure 1] show the mean BIS scores of the subjects in the two groups from 1 to 90 min of surgery. Figure 1: Mean bispectoral index scores of the subjects in the two groups from 1 to 90 min of surgery. The results of the repeated measure ANOVA test showed that the difference between BIS scores in each group at different measuring times was significant (P < 0.001). The independent t-test was used to examine the difference between BIS scores of the two anesthetic agents. There was no statistically significant difference between the two anesthetic agents in terms of BIS scores (P > 0.05). Pearson correlation coefficient showed that regardless of type of anesthetic agent, there was a negative correlation between age and BIS scores (r = −0.64, P < 0.001). The test also showed similar results between agitation scores and age (r = −0.71, P < 0.001). Pearson test results also showed that age negatively correlated with duration of anesthesia and discharge time (r = −0.308, P = 0. 01) and (r = −0.55, P < 0.001). A significant correlation was also observed between the rate of agitation at min 10 (r = 0.392, P = 0.001), 20 (r = 0.268, P = 0.022), 30 (r = 0.244, P = 0.033), 40 (r = 0.319, P = 0. 008), and 50 (r = 0.226, P = 0.047), and discharge time. 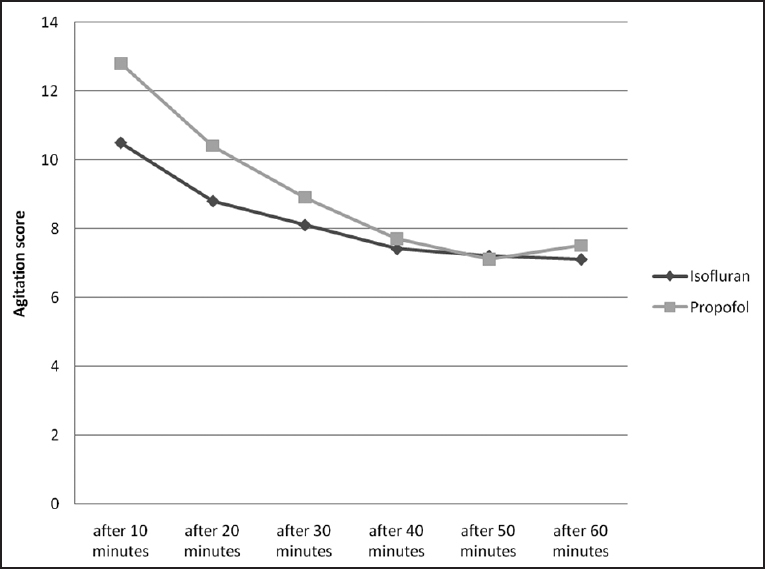 The correlation between agitation score at min 60 and discharge time was not statistically significant (r = 0.12, P = 0.21). Pearson test results also showed a significant correlation between the rate of agitation and duration of anesthesia at all the above minutes (r > 0.500, P < 0.001). In addition, agitation showed to have a significant correlation with BIS scores at all the above minutes (r > 0.250, P < 0.02). There was also a significant correlation between BIS scores and the duration of anesthesia (r > 0.380, P < 0.002) and the discharge time (r > 0.325, P < 0.007) at all the mentioned times. [Table 2] and [Figure 2] show the mean agitation score in both groups of the study during recovery. Figure 2: Mean agitation scores in both groups of the study during recovery. Repeated measures ANOVA tests showed that the differences between agitation scores at the times of measurement were statistically significant (P < 0.001). The independent t-test showed that the mean agitation score was significantly more in the propofol group than in the isoflurane group at the 10 th min (P = 0.046); the difference between the two groups was not statistically significant at other times. Of the 57 patients, 20 (35.1%) showed recovery complications, 9 of whom were in the isoflurane group (31%) and 11 in the propofol group (39.3%). The independent t-test results showed statistically significant difference between the recovery complications in both groups (P = 0.001). The group with recovery complications were younger (P = 0.002) and had higher agitation (P < 0.022) and BIS (P < 0.012) scores. In addition, the duration of anesthesia was longer in the group with complications (P < 0.001). However, the relation between agitation scores in the 50 th and 60 th min with the recovery complications was not statistically significant (P > 0.05). During the recovery period, the researchers had to use analgesics in only 5 cases (8.8%), of whom 2 patients (6.9%) were in the isoflurane and 3 (10.7%) in the propofol groups. In this study, the null hypothesis was not rejected; no significant difference was observed between the BIS scores of individuals who had received propofol and those who had received isoflurane (P > 0.05). Propofol showed earlier discharge time than isoflurane (P = 0.01). Mehmandoost and Naghibi  compared the effectiveness of isoflurane and propofol on consciousness levels of women undergoing a cesarean. The results of their study showed no significant difference between the two agents in terms of patients' consciousness level, BIS, and hemodynamic variables. From 90 patients in their study, only 7 patients showed recovery complications (8.9% and 6.7% in propofol and isoflurane groups, respectively); and no significant differences were observed between the two anesthetic agents. The results of the present study are consistent with those of Mehmandoost and Naghibi where there was no statistically significant difference between propofol and isoflurane in maintaining deep anesthesia; both agents provided similar anesthesia depth. Katoh et al. evaluated the role of age in BIS scores. The results of their study showed that the need for anesthetic agents had a negative correlation with age but had no effect on BIS scores. They concluded that BIS could be used in communities with a wide age range for determining the depth of anesthesia. The results of the present study revealed a statistically significant (P < 0.001) correlation between BIS scores and the patients' age. They also indicated that BIS scores have a negative correlation with age and, consequently, with the dose of anesthetic agent needed for maintaining deep anesthesia. In both studies, the older patients needed a less anesthetic agent dose, though the changes in BIS scores varied by age in both studies. This variation could be due to the difference in the number of subjects in the sample groups of the two studies. The participants in the study of Katoh et al. were between 18 and 85 years of age; whereas, those in our study were 4-7-year-old. Katoh et al. used sedation in their study, while anesthesia was used in the present study. Hence, it is not possible to compare the two studies; further studies need to be conducted under similar conditions to verify the results. In a study, Kaviani and Karamzadeh  evaluated the effect of two intravenous and inhalation anesthesia methods on the rate of postoperative agitation in children. Their results showed no difference in the degree of agitation between their groups but indicated a negative correlation between the rate of agitation and age. The results of the present study showed that the agitation scores were higher in the propofol group, and the difference between the two anesthetic agents was statistically significant at the 10 th min. It can thus be inferred that the type of anesthetic agent in this study had no effect on the rate of postoperative agitation. Regardless of the type of anesthetic agent in the present study, a significant correlation was observed between age and agitation rate; the younger patients showed higher agitation scores. Thus, basedf on the results of this study as well as those of Kaviani and Karamzadeh;  age is an important factor in the outbreak of postoperative agitation. The incidence of recovery complications in various studies has been variable. In a study, Duncan et al. investigated anesthesia complications in 6914 patients in 4 Canadian hospitals and reported the incidence of complications at 8%, whereas Hines et al. in a study of 18,473 patients in a training hospital noted incidences of postanesthesia recovery complications at 23.7%. In a study on 90 patients in 1987, Edelist  investigated the effects of two, propofol and thiopentone, anesthetic agents . His results revealed that, after regaining consciousness, recovery complications were detected in 38% and 47% of patients who had received propofol and thiopentone, respectively. Such factors such as duration of anesthesia, anesthetic technique; and even the organ which is being treated affect the incidence of recovery complications. These factors can justify the reasons for major differences between complications detected in different studies. In the present study, the recovery complications were detected in 31% and 39.3% of individuals who received isoflurane and propofol, respectively. The percentage of complications in the propofol group was the same as Edelist,s study. The difference between the two used anesthetic agents was statistically significant; nevertheless, the isoflurane group showed fewer complications in maintaining the depth of anesthesia than the propofol group. The results of the present study showed a significant correlation between age, agitation scores, BIS scores, duration of anesthesia, and the incidence of recovery complications. The younger patients showed more complications and had higher agitation, BIS scores, longer duration of anesthesia, and greater probability of complication occurrence. It is likely that younger children have more agitation after operations and are less able to endure the anesthetic agent. In addition, the results showed that younger patients needed a more anesthetic agent dose. The longer duration of anesthesia indicates the longer effect of the anesthetic agent, and the probability of a proportional increase in the anesthetic agent's side effects, which may entail recovery complications. It is recommended that further studies be conducted on other anesthetic agents. In addition, we recommend similar studies using other methods of measuring agitation to compare methods and to ensure their accuracy. Both propofol and isoflurane produce similar depth of anesthesia, but isoflurane produces fewer recovery complications. In older patients and those with higher BIS and agitation scores, the need for anesthetic agents decreases. The higher the agitation and BIS scores and the longer the duration of anesthesia, the higher the probability of recovery complications occurrence. Tickle M, Milsom K, King D, Kearney-Mitchell P, Blinkhorn A. The fate of the carious primary teeth of children who regularly attend the general dental service. Br Dent J 2002;192:219-23. Al-Taher W, Mansour EE, El-Shafei MN. Comparative study between novel sedative drug (dexmedetomidine) versus midazolam - Propofol for conscious sedation in pediatric patients undergoing oro-dental procedures. Egypt J Anaesth 2010;26:299-304. Kaviani N, Dashti NK. Evaluation of the effect of two intravenous and inhalational general anesthetic methods on emergence agitation of children subsequent to dental procedures. J Isfahan Dent Sch 2011;7:36-39. Kaviani N, Shafiei AR. Comparative study of recovery time and complications after anesthesia with propofol in mentally retarded and healthy patients. J Isfahan Dent Sch 2011;28:120-124. Bong CL, Ng AS. Evaluation of emergence delirium in Asian children using the Pediatric Anesthesia Emergence Delirium Scale. Paediatr Anaesth 2009;19:593-600. Uezono S, Goto T, Terui K, Ichinose F, Ishguro Y, Nakata Y, et al. Emergence agitation after sevoflurane versus propofol in pediatric patients. Anesth Analg 2000;91:563-6. Turner DAB. Emergency anaesthesia. In: Aitkenhead AR, Rowbotham DJ, Smith G, editors. Textbook of anaesthesia, 4 th ed. Edinburgh (UK): Churchill Livingstone; 2001. P: 619-28. Jurd R, Arras M, Lambert S, Drexler B, Siegwart R, Crestani F, et al. General anesthetic actions in vivo strongly attenuated by a point mutation in the GABA(A) receptor beta3 subunit. FASEB J 2003;17:250-2. Kati I, Demirel CB, Anlar O, Hüseyinoglu UA, Silay E, Elcicek K. An unusual complication of total intravenous anesthesia: Mutism. Anesth Analg 2003;96:168-70. Katoh T, Bito H, Sato S. Influence of age on hypnotic requirement, bispectral index, and 95% spectral edge frequency associated with sedation induced by sevoflurane. Anesthesiology 2000;92:55-61. Liu SS. Effects of Bispectral Index monitoring on ambulatory anesthesia: A meta-analysis of randomized controlled trials and a cost analysis. Anesthesiology 2004;101:311-5. Lo YL, Lin TY, Fang YF, Wang TY, Chen HC, Chou CL, et al. Feasibility of bispectral index-guided propofol infusion for flexible bronchoscopy sedation: A randomized controlled trial. PLoS One 2011;6:e27769. Chamoun NG. An introduction to bispectral analysis for the electroencephalogram J. Clin Monit 1994;10:392-404. Johansen JW, Sebel PS. Development and clinical application of electroencephalographic bispectrum monitoring. Anesthesiology 2000;93:1336-44. Wong J, Song D, Blanshard H, Grady D, Chung F. Titration of isoflurane using BIS index improves early recovery of elderly patients undergoing orthopedic surgeries. Can J Anaesth 2002;49:13-8. Mehmandoost M, Naghibi K. Comparative study of the effects of two anesthetic methods with propofol and isoflurane on mother′s awareness during the operation and A.P.G.A.R. Score in the newborns delivered by elective cesarean section. J Isfahan Med Sch 2013;31:228. Duncan PG, Cohen MM, Tweed WA, Biehl D, Pope WD, Merchant RN, et al. The Canadian four-centre study of anaesthetic outcomes: III. Are anaesthetic complications predictable in day surgical practice? Can J Anaesth 1992;39(5 Pt 1):440-8. Hines R, Barash PG, Watrous G, O′Connor T. Complications occurring in the postanesthesia care unit: A survey. Anesth Analg 1992;74:503-9. Edelist G. A comparison of propofol and thiopentone as induction agents in outpatient surgery. Can J Anaesth 1987;34:110-6.